Martin Elias Ridinger (1731 Augsburg 1780). This Stag of 3 Antlers was hunted par force by His Princely Highness the Ruling Landgrave LOUIS VIII of Hesse-Darmstadt in the Great Pheasantry near Cranichstein Aug. 11, 1753, where the same set above a wall 12 shoe high and escaped, but was shot after the rutting season of the very same year (“thus about October 1753”, Weitz) at the border in high comital Erbach Schönberg territory (“south of Darmstadt”, W.). Copper printing plate in reverse after Georg Adam Eger (1727 Murrhardt 1808). (1767/68.) Inscribed: G. A. Eger delineav. et pinxit. / M. El. Ridinger sculps. Aug. Vindel., otherwise in German as above. 14⅝ × 9¾ in (37 × 24.9 cm). with full-page illustration of the print. (Lohmann, Georg I. und die Anfänge von Jagdschloß Kranichstein, no year, p. 70, after Dehio, Handbuch der dt. Kunstdenkmäler, vol. Hesse, 1982, p. 518). in the reddish-golden brilliance of its 251 years old copper . (Stefan Morét in Catalog Darmstadt, 1999, pp. 62 f. See also the printing plates there I.13, I.8 & I.11, color ills. 6 & b/w ills. pp. 63 f.) acquired here. At which not only after realization here the impact of the eldest, Martin Elias, as the etcher/engraver of the plate here being up on the Ridinger œuvre is much larger than that of an engaged co-worker only. 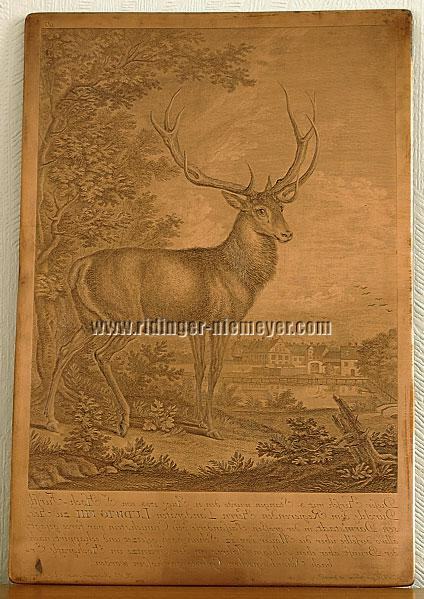 Already at an age of thirty he just acted as a spiritus rector behind the scene ensuring that sets were completed as just also the monumental 101-sheet one of the Wondrous Deer to which the plate here belongs, too. Of the last 27 works Martin Elias conveyed to the printing-plates alone 21! Without him the plate offered to you here would not exist! And as Wolf Stubbe (Joh. El. Ridinger, Hamburg/Berlin 1966, pp. 16 f. & pl. 34), going in medias res, celebrates Th. 722, The Wild Buffalo and the Crocodile, from the Fights of Killing Animals as an artistic zenith of the late work in respect of its luminous efficiency, he pays tribute together, because judging by the plate, not the drawing, to Martin Elias as the etcher/engraver of that work. An aspect illustrating deeply the Ridinger teamwork. – The original numbering “97” restored again on occasion of a later 19th century edition after it had been changed for a separate set in the mid-twenties. in front of the Kranichstein pool and the complex of the palace . (Gisela Siebert, Kranichstein, 1969, page 14). And taken from no lesser, though not preserved in Kranichstein (see, however, besides the trophy there, VI.10c of the Catalogue Darmstadt with illustration, Eger’s large portrait painting of the stag, VI.10a, and the drawn study of the head ascribed to Eger, VI.10b with ills. ), design than that by of the court hunting painter who joined the court in 1748, and in whom the close connection to the Ridingers obviously originated, and due to the age preferably lasted with Martin Elias. Because 6 of the 12 plates of the Wondrous dedicated to Hesse-Darmstadt (10 of these to Louis VIII personally) plus Th. 356 & 385 as also referring to Louis and later taken over from the Incidents have been worked by Martin Elias, four of these after Eger. Beyond these after the latter the equestrian portrait of Louis from the Princely Persons and two further designs. (Siebert, op. cit., pages 63 & 109). the most dominant plate of the Hesse-Darmstadt block . a thematically quite unique , optically magnificent , worldwide unique absolutum. Proposed to you with the recommendation of a timeless-elegantly frameless – fittings included – hanging for that you will experience the reflection of the respective light to the fullest.